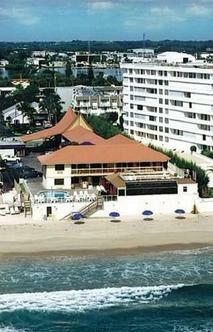 The Palm Beachfront Inn is a beautiful 50s style boutique hotel. the property is located on the southern tip of Palm Beach Island about five miles from the world famous Worth Ave shops. The hotel is on one acre of direct oceanfront beach next door to the Ritz Carlton and the Four Seasons. it is a full service hotel with a bar and a restaurant so close to the water you can actually feel the sea spray. you can lounge by the oceanfront pool, on the beach under a cool shade of a cabana while enjoying a tropical drink of have lunch on the sun deck overlooking the Atlantic ocean.